Wall mountable or desktop acrylic shoes - sneakers - cleats case. Holds 1 or 2 shoes. memorabilia collection. Price includes 1 free nameplate. Wall mountable or desktop acrylic shoes - sneakers - cleats case. Holds 1 shoe. 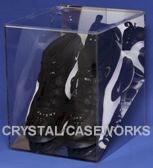 Glass display case holds 1 baseball, football, basketball or other cleat - cleats - shoes. Furniture grade wood base, real UV protected glass and mirrored back panel. The base is also mirrored so you can see the entire shoe. Includes 1 free nameplate. Inside measurements: 15L x 5-1/4W x 5-3/4H. Desktop acrylic shoes - sneakers - cleats display case. Holds 1 shoe up to size 16. 15L x 6W x 7H.